Little and often: (How) Is giving to charity like weight watchers? David Erasmus wants us to give to charity little and often. He draws parallels between charitable giving and dieting and thinks there is a role for the weight watchers of donating. Giving little and often will help get us into a giving habit. He may be right. Good intentions – losing weight, giving to charity – can be hard to keep. We know what the long-term benefits are, but there is some short-term pain. Giving to charity may not be as costly as giving up sweet and fatty treats, but it takes time and effort out of busy lives. So how does weight watchers help? First, there is the public commitment to fulfilling the good intention; this makes it costly NOT to take action. The super rich are already doing this through their Giving Pledge; the same principle could be applied on a smaller scale. Second, regular meetings and weigh ins provide immediate benefits. And there may be more satisfaction in (publicly) losing a pound a week for 10 weeks than in losing the 10 pounds in one go. The same could be true of giving. Economists think the “warm glow” from giving comes from the (total) amount given. But could it be more rewarding to give £1 ten times than to give £10 once? Diminishing marginal utility may mean it makes sense to spread donations – if you give £10 in one go, the first pound adds more to your happiness than the tenth, so why not spread it out? The very act of giving also gives us satisfaction. Psychologists have shown that giving money away makes people happy; and are doing more work to understand why this is. Personal connections and having an impact seem to be important, not just the total amount given. Third, weight watchers opens up the process to public scrutiny. People feel good from having other people appreciate and share in their weight loss. Also, like the initial commitment, it also almost certainly makes it more costly to give up giving up. So, perhaps there is something in the idea that giving little and often and in public can make the process of donating more rewarding and can help to sustain a longer-term commitment to a good intention. The only real difference is that while most people hope to attend weight watchers only once, charitable giving should be something that they are more than happy to carry on with. CAF and NCVO have today published the latest UK Giving report showing a decline in donations to charity. The estimated total amount donated to charity by adults in 2011/12 was £9.3 billion, a decrease of £1.7 billion in cash terms, and a decrease of £2.3 billion in real terms, compared to 2010/11. Much of this decline is likely to be attributable to the ongoing economic climate. Looking at historical data, we know that donations were fairly resilient in previous recessions in the early 80s and early 90s. But this recent recession has lasted much longer and now appears to be hitting giving hard. In the past, donations have also tended to rise strongly when the economy grows, so let’s hope this bodes better for giving bouncing back in the future. However, analysis that I recently did for CAF points to clear generational patterns in giving that may be more worrying for the prospects for donations. The research highlights a divide between pre- and post-war generations in terms of trends in giving. Among pre-war generations, there was a clear tendency for subsequent generations to be more likely to give at each age than their predecessors, and to be more generous. Among post-war generations, these trends – particularly in the proportion giving – have been going in the other direction. As a consequence of these generational changes, the giving population is ageing. Thirty years ago, around one-third of donations came from the over-60s. Today it is more than half. A number of commentators have questioned these findings. In the discussion that followed the report’s publication, a number of points were raised about the analysis, all of which were legitimate, but none of which invalidated the research findings. First – it was argued that we would expect some ageing of the donor population since the general population has been ageing. This is true, but the donor population is ageing faster than the general population. As noted in the original report, the share of giving done by the over-60s has been rising much faster than their share of total spending. Second – the analysis focused on giving at the household level since many couples make joint decisions about giving. The rise in single-person households mean that the composition of households today is not the same as it was thirty years ago. But the same trends in giving are present if the analysis is done at the individual – not the household – level. The generational divide is not something that can be explained by the rise in single-person households. Third – much of the media analysis focused on low levels of giving among young households (in their 20s and 30s). This led many to point out – quite rightly – that people in their 20s and 30s today face many new financial pressures that their predecessors did not – from student debt to high house prices. But, the report is clear that the generational divide is one between the pre- and post-way generations, not something that is unique to today’s 20 and 30-somethings. People in their 50s today (the 1960s baby boomers) are less likely to give than today’s older households did when they were at the same age. A number of factors may explain the generational divide – including changing religiosity, wider trends in civic participation (interestingly, other people have found similar trend when they have looked at voting, for example) and even the growth of the welfare state which for some people reduces the rationale for giving to charity. It is hard to say for sure why the post-war generations are less likely to give than their pre-war predecessors, but important to bear these long-term trends in mind when looking at the latest dip in giving. A recent poll by Workplace Giving, a payroll giving company, indicated that of 1000 respondents, 68% would favour the introduction of an automatic-enrolment system for payroll-giving. This kind of system would make the default for all workers in participating firms to be enrolled in a the scheme, giving to a given charity at a given level – they could then, if they so wished, opt-out of the scheme, or change the amount they give, and/or the charity to which they are giving (64% of respondents indicated a preference for having a hand in choosing the charity in the first place). Why should this be the case? Only a minority of workers (only 6% of workers in participating firms, 2.4% of all workers), actually give through payroll giving at the moment. While it is natural to suspect some selection bias in the answers to these questions, the magnitude of the difference suggests that at least some respondents who answered positively about the automatic enrolment system are not currently enrolled in payroll giving schemes in their firms. If they are so keen to give to charity that they would favour and opt-out arrangement, why do they simply not enrol themselves in existing schemes, or set up a direct debit of their own accord? Work from across the field of Behavioural Economics appears to suggest some answers. The first, and most obvious suggestion, is that individuals have a self-control problem, and continue to put off the act of enrolling. In these cases, a self-aware individual may prefer a “commitment device” such as an automatic-enrolment system, which compels (or in this case forces) them to partake. Evidence from the pensions literature in the united states suggests that automatic enrolment can have powerful effects on individuals’ behaviour in overcoming their self-control problems. Respondents to the survey may also be demonstrating systematic overconfidence. Although the existence of this phenomenon is observed in previous research, for example finding that 93% of all drivers believe they are above the median ability, it is particularly interesting when combined with self-control problems. Despite previous evidence to the contrary, for example not yet having signed up to Payroll Giving, individuals strongly believe that they are more likely to overcome their self-control issues in the future. Given their expectation that they will sign up to payroll giving…tomorrow, and that their colleagues will not, automatic enrolment will make no difference to them in the long run, but will have a larger impact on others’ giving. Finally, the institution of an opt-out is likely to induce more homogeneity of charity choice (among those passively remaining in the scheme), compared with softer policies such as “active enrolment”, whereby individuals are compelled to make a decision for themselves (often through a mandatory form). If the respondents were motivated by a particular cause (heart disease, for example), and believe themselves a more active participant in decision making, a prescriptive policy may be better for them, albeit at the cost of social welfare. These phenomena, and others like them, may pose significant obstacles to the Government’s plan to induce a ‘step change’ in giving in the UK – something which, as this blog has previously discussed, will be very hard to do. They also point to a more nuanced problem with giving; instituting auto-enrolment may increase the level of giving, but if workers are heterogeneous in their charity preferences, it may decrease social welfare, or be a second best policy compared to a softer intervention. Although the results of this poll are positive for those who support payroll giving schemes, it is clear that more research must take place before we are able to accurately predict its effects. Choi, Laibson, Madrian, Metrick (2006) “Saving for Retirement on the Path of Least Resistance”. Behavioral Public Finance: Toward a New Agenda. Ed McCaffrey and Joel Slemrod, eds. New York: Russell Sage Foundation pp304-51. Svenson (1981): “Are we all less risky and more skilful than our fellow drivers?” Acta Psychologica 47: 143-148. At the end of last year, the Irish government received rather unfavourable coverage for its suggestion that it help the work of many charitable organisations by distributing the European cheese mountain to the poor. In fact, research that we publish today finds a new link between charitable giving and cheese. On average, UK households spend as much on cheese as they do giving to charity – around 0.4 per cent of their total spending. Of course the aim of our research is a little broader than the charity-cheese comparison. We analyse more than thirty years of data on household charitable giving and look at the main trends over that period. We find that a lower proportion of households today give to charity in a two-week period than was the case three decades ago (27 per cent compared to 32 per cent). However, the Millennium year marked a turning point in the long-term downward trend (in 1999, the proportion was down to 25 per cent). This was a year in which the government reformed Gift Aid. There were also many individual charity campaigns. On average, households give more now in real terms than they did three decades ago – £2.34 in 2008 compared to £0.98 in 1978. This takes account of donors and non-donors. The fact that real donations have gone up in spite of falling participation is because donor households are giving a lot more (their donations have done up nearly three-fold over the period). However, looking at the past twenty years, the rise in donations has done little more than keep pace with rising GDP. As a share of total spending, households are giving exactly the same now (0.4%) as they did ten years ago – and as they did twenty years ago. This is in spite of big changes in charity fundraising, in tax incentives and in methods of giving. The good news about the resilience in generosity is that giving appears to be fairly recession-proof, for example. But, it may be hard to achieve the kind of step-change in generosity that David Cameron sees as part of his Big Society. Charities might rightly feel that they have had a tough year. First the recession which many charities claim hit their donations. Then, the announcement of public spending cuts which will affect thousands of charities which rely on government funding. The festive season should therefore bring a brief respite and provide a temporary boost to charity incomes as this is the time of year when people really do dig a little deeper and give more to charity than during the rest of the year. The chart below shows average weekly household donations to charity for each month in the year – there is a spike in march/april, coinciding with the end of the tax year, but a greater spike in December. Santa, it appears, has a greater effect on giving than the tax man. 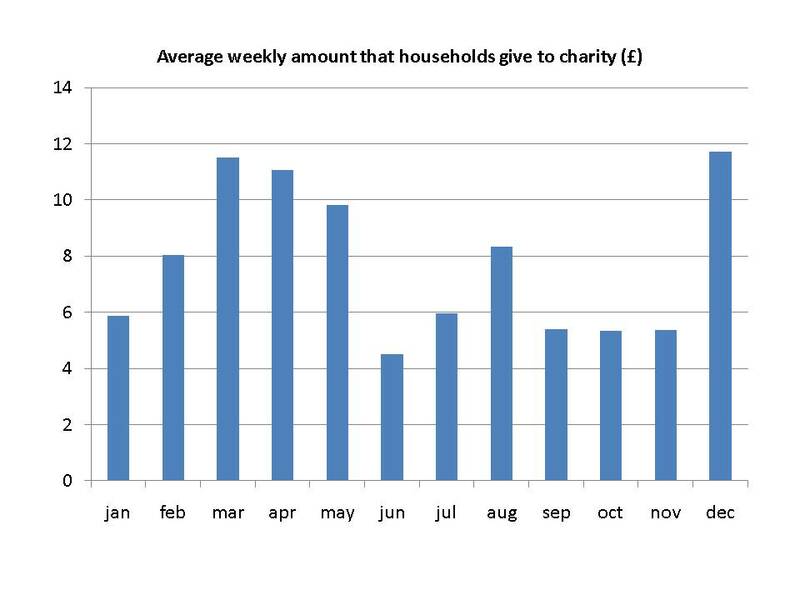 These averages are for households that actually give to charity; the proportion of households who give is also slightly higher in December than at other times of year, but it is the amounts that people give that show the biggest increase at Christmas. The average weekly amount given is nearly £12 in December – more than twice the average amount over the preceding three months. It is hard to say exactly what accounts for the festive increase – other than it being the season of goodwill to all men. Some of it may be religiously motivated; the evidence shows that religion is strongly associated with charitable giving and that people who are religious are more likely to give to charity and to give more. Yet as religiosity has declined in the UK over the past thirty years, Christmas giving has remained high and, if anything ,has increased over time. In 2008 (which is the latest year for which we have data) giving in December was 60 per cent higher than the average over the rest of the year; thirty years ago (over the decade 1978-88) it was roughly 16 per cent higher. As part of the Big Society, the government is keen to encourage charitable giving. Research that we carried out on behalf of HM Treasury showed that tax incentives are not particularly effective at encouraging people to give more. The majority of people do not respond to changes in tax incentives by changing how much they give, although this does mean that Gift Aid style incentives that allow the charities to claim back the tax paid on donations can help to boost charities incomes (more than rebate-style incentives which rely on donors to adjust their giving). Understanding the December effect could give insights into what motivates people to give and be used to design more effective policies. As charities enter 2011 facing up to the reality of cutbacks in public spending both they and the government will be keen to ensure that higher giving is not just for Christmas.